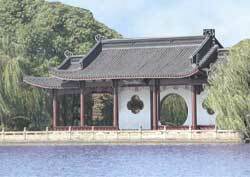 West Lake's serene beauty has been extolled for over a thousand years. This small isle has the conversation piece distinction of having its own lake, which in turn has its own island. There's much to enjoy, including scenic gardens, picturesque pagodas, zigzag bridges, and willowed shorelines. It's during the spring when the pink peach blossoms bloom. They are early morning and later afternoon when the sun's low angled rays accentuate the trees, bridges and pavilions. They are special, too, when the calm West Lake reflects the full moon. They take you around the lake and to Lesser Yinzhou island. Two causeways take you to two of the other islands in West Lake.